Speaking of in-depth, this review was 3700+ words long. Trust me, that’s a lot. 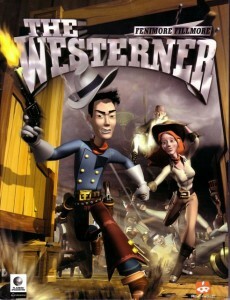 All in all, The Westerner was a terrific game – too bad they changed the direction so much in the sequel. First published on Just Adventure+ in March 2, 2004. Last time I reviewed a Spanish piece of software, it turned out to be one of the most satisfying adventures I had played in ages. Just like in Runaway, you can tell right away from the beginning that the people behind The Westerner are genuine fans of classic adventures. It’s even more evident here for a number of reasons you’ll learn in a few moments. The whole adventure scene from Spain has, in general, a very old-school feel, which, to hopelessly nostalgic people like me, is extremely appealing. With Runaway, The Westerner and a few other games, which I will hopefully review in the future, Spain is, from my point of view, carrying the torch of adventures right now. Now, let’s get on with business: perhaps you remember Fenimore Fillmore from his previous adventure (or perhaps not as it was seemingly unknown outside Europe), 3 Skulls Of The Toltecs. Well, that game left a bit to be desired, but now Fenimore is back with a vengeance! The old west has never looked so colorful. It was a couple hours into the game when I realized why it was titled The Westerner — it takes place in the Far Old West and our friend Fillmore, besides being the city where infamous Pink Floyd and Frank Zappa shows took place, is an old-fashioned cowboy with fancy hat and all. 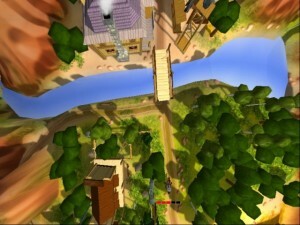 Obviously, the game is quite similar to its predecessor, which was touted as a “western Monkey Island”, with the small exception that now is fully rendered in real-time 3D. No NO, put that chair down! The only difference between a classic 2D point n’ click adventure and this game is the graphics engine. Very much like the most iconic western movie, you get to ride a horse, rob a bank, exchange a few bullets with the villains in turn and drink up to the point of cirrhosis at the local saloon bar. So is the tough life of a cowboy! It soon becomes apparent that plot isn’t the focus of The Westerner. The whole story can be told in a few lines: Fenimore arrives in town, just in time to witness some intimidating looking men harassing a farmer. Being the hero he intends to be, he intercedes and somehow manages to scare them away. As a gesture of gratitude, the farmer, Bannister, invites Fenimore to have dinner with his family and puts him in the know of the town happenings: the bad guy in turn, Starek, who literally runs this place, is obsessed in getting rid of every single farmer, either by incriminating them with made-up felonies or just shooting them. Obviously, he’s also pulling the strings of the local sheriff. As you’re probably assuming, Fenimore accepts to help the farmers because if he didn’t, to put it bluntly, there wouldn’t be a game. Now, I have no idea how they’re going to translate this, but there’s this common plant in Spain, which is widely used in foods. Fenimore has some kind of allergy of it and, by his own words; he could die if he ate one! Well, according to my handy dictionary it’s the “artichoke”. I’ve never tasted one and with such a name I’m not intending to. There are a couple of funny jokes with the artichokes during the introduction, which, if I may say, was very nicely done. There’s a whole cinematic feeling to The Westerner and every single cut scene is fantastic. Back to the plot: Fenimore learns that he must solve three tasks (sound familiar?) to help the farmers stand up to Starek: get one more man to help defend the farms, weapons to have something to defend themselves with and somehow stop more Starek’s henchmen from arriving to town. Of course, the story isn’t complete without a damsel in distress and, in this case, she’s (surprise!) Starek’s nephew Rhiannon. Too bad Fenimore falls in love with her before knowing this. Not only does she have a mean uncle, you can’t imagine the dork she’s about to unwillingly marry! 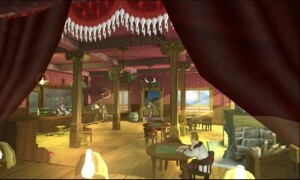 In one of the game’s most enjoyable moments, Livy, Rhiannon’s servant, helps Fenimore to sneak inside Starek’s mansion to meet her loved one and express his feelings. No, I’m not going to tell you what happens next, but this is a family game. Like with Monkey Island, which once more seems to be most obvious source of inspiration here, the absence of a plot is made up with way too funny situations and memorable characters. If there is one area where The Westerner truly shines, it is the characters. They are so charming and well animated that you’ll think you’re watching a cartoon picture. This combined with the colorful 3D world is, my friends, a real feast to the eyes. The expressions of Fenimore have to be seen to be believed. The rest of the facials aren’t on par with him but Rhiannon and Livy deserve a mention of honor. Livy is probably the most likable character after Fenimore, although conversations with her can be reeeally winded-up. The dialogues are some of the best I’ve heard in a while and each character has plenty of lines. Thankfully, the voice acting is very good, if not great, in this Spanish version. I’m keeping my fingers crossed and hoping they’ll keep this level of quality or improve it for the English version. All in all, The Westerner brings a whole new meaning to the term “guilty pleasure”. It ain’t the Old West without a saloon bar. 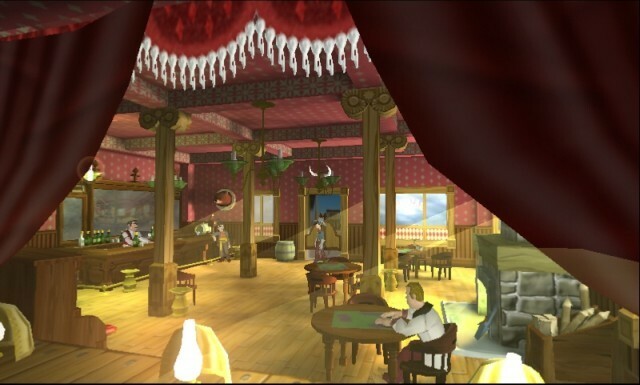 It’s no secret that The Westerner in general is very Lucasarts-y, both in style and design. Imagine a 3D Sam & Max and you should have a pretty close idea of how it plays. Come think of it, at least until the new Sam & Max is released, this is definitely the king of 3D point n’ click adventures (admittedly, there aren’t many of them). Those wondering about the 3D aspect need not to worry: this is a traditional adventure disguised as a cutting edge game. Just to clarify, the interface isn’t an experiment like Gabriel Knight 3, in which you controlled both the camera and character with mixed results — it’s a classic interface done in 3D: point a hotspot, toggle between “look” and “use” and click. In the case of The Westerner, the “look” action actually works as a “zoom” action that brings up a close-up of the object or person in question. This also brings a couple of problems. One of them is that sometimes something is on the way of the close-up, either Fenimore himself or the door of a closet. The other problem is an evident lack of feedback from the character. I’d love to hear Fenimore comment about some things but, alas, all I get is a closer view of them. An example of a weird situation this brings: in the town you find a bull behind a jail, something quite strange I’d say. I was really wondering about this and it would have been great to have Fenimore accompanying me in my curiosity, perhaps with a silly remark, as I didn’t know what to make out of it until later. The interface works great but, of course, it’s not perfect. For instance, you have to click on the ground to make Fenimore move around. It would have been more comfortable to just make him move toward the direction you point since sometimes the ground or floor you wish to walk are behind something, like a building, and you have to wait for the camera to switch. Hardly an issue. 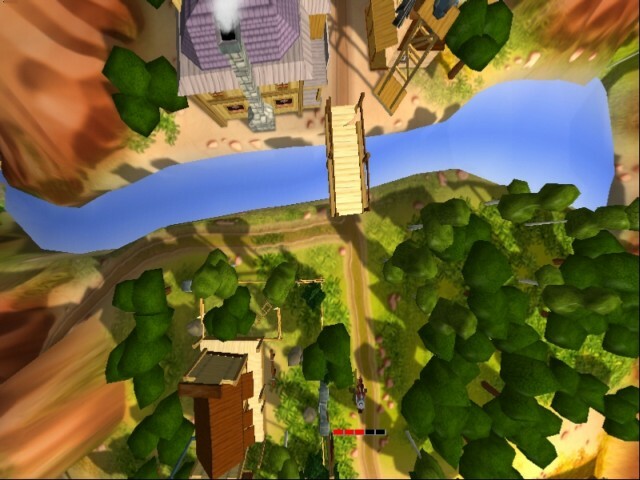 You also have the usual camera problems with angles, but those are akin to 3D games in general. Anyway, this is a living testament that 3D and direct control doesn’t necessarily have to be married together. It seems that Revistronic is not afraid at all to acknowledge their influences as there are some classic Lucasarts jokes thrown around. For instance, after the game ends, there is a big red message urging you to insert CD 2 (which obviously doesn’t exist). For the youngest adventurers, that was a very funny Easter egg from Monkey Island. There’s even an insult fighting puzzle! This kind of acknowledgment can be also appreciated in Pendulo’s, the makers of Runaway, first adventure ; Objective: Wacky… Kiwi… Uikokahonia, which will be soon reviewed at your favorite adventure site. Besides being clearly inspired by classic adventures, Fenimore seems to vaguely resemble Woody from Toy Story although I can’t really tell whether this was intentional or not. There’s also a nod to The Wild Wild West movie as you happen to find a robot and an odd mechanical contraption in a fair. Now, I will do my best to transmit my feelings about one particular thing. You have to move around a lot in The Westerner and you do this using the quintessential element present in nearly every non-linear adventure: the map. The map, by definition, is an overview of the current gaming area. So, you generally click on the location you wish to visit and then you travel to it, perhaps witnessing a previous cut scene. The map in this game works all the same. As a matter of fact, there’s nothing special at all about it, but it has the exception that is the best frigging’ map ever!! No, wait — allow me to rephrase that: the best damn friggin’ map ever!! Mostly because it’s in 3D and it has a cool “warped” effect when you scroll through it that makes you drool all over your keyboard. And it has such a lot of detail, I don’t know. I mean it’s… its like total w00t! The music could have used a bit more of work but, at the least, it never gets in the way and that’s enough. The only memorable tune, and the one you will probably find yourself whistling while playing, is the “default” walk-around tune. As a matter of fact, I’m whistling it right now so it has to be the tune that most clearly identifies the game. That or I need more sleep. If you despise 3D in your adventures, this is the game that will make you embrace it like the most gorgeous thing ever. 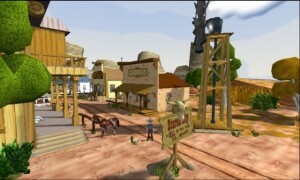 The Westerner puts you in a charming and very lively world without intrusive controls or scarifying any gameplay. Too good to be true? Keep on reading. John Wayne must be spinning in his grave. Puzzles in The Westerner are fair and logical. Only a couple of them found mewondering what the heck they were thinking. I wish I could tell you more, but I vowed to never spoil a game on a review. Now, the thing that really bothered me was when Fenimore dies at the end because you — oops. As I told you, Fenimore has to sort three major obstacles, namely: get one more man to defend the farms, stop the train where Starek’s men are traveling and buy a farm defense kit. These big puzzles are actually comprised of several puzzles each one of them. It’s a tried and tired formula but it still works well. I probably don’t need to mention how non-linear the game is, but I just did. Overall, The Westerner is pretty straightforward puzzle-wise. They’re mostly on the easy side, but there are many of them to keep you busy. Some puzzles become rather tricky because of the lack of customized responses. For instance, I wanted to open a chest but Fenimore told me “I can’t do that”. Why? Is it locked? Do I have to care for it? Whenever I tried using an item in a way that made perfect sense to me, I also got similar responses, like “Better not”. Whether it’s laziness or a conscious decision, this lack of customized feedback, not only makes puzzles more difficult in the wrong way, it takes away some of the charm Fenimore has. Well, look at the bright side of it; at least you don’t have to push any crates around (guess which game I did NOT like). I was very happy to have optional stuff to do, especially one puzzle that can make you save a lot money. Yes, you read that well: money. You need money to buy stuff and sort out a couple of particular situations. Generally, the only way to get it is looking around in drawers. If you do things right, like doing that optional stuff I said, you should get plenty of it. If you don’t, you’ll be in trouble because there isn’t much scattered around. In case you spend all of it, you’ll have to visit locations again and pray for more dollars to show up. One very nice detail is a set of hints, nearly puzzle solutions I should say, cleverly integrated in the game in the form of newspapers. In those you can read about past news that incidentally resemble the exact things you have to do to overcome the three major obstacles. They almost blatantly tell you the final step to solve them, so I’d advise to stay clear of those newspapers unless you’re hopelessly stuck. You have to pay for them anyway — nothing’s free! Whether a blatant rip-off or praiseworthy homage, the insult dueling is the most annoying puzzle to be found in the game. Not because it’s difficult, but because you don’t understand its mechanics except with trial and error and expending many dollars. Taking into account the problem I mentioned with them, well, you get my point. While in Monkey Island you met several opponents whom gradually gave you more and more responses, in The Westerner there is only more man aside from the one you have to defeat, one of Starek’s boys. He gives you new responses at a very slow rate and, only after you lose a match with the Starek’s henchman, he’s replaced with another one who has new responses. It’s never quite clear how to accomplish this and that’s the major problem with this obstacle. One of the opponents actually shows up after completing another different puzzle! I’m not sure whether they’re annoying or not, but some gamers won’t appreciate the inclusion of arcade sequences. One of them actually works as a mini-game you can use to raise more money, but still has to be solved in order to finish the game. It consists in shooting moving targets in a fair game. That one was nice if a bit long because you have to lose it once in order to figure out what to do next. A second one is the one that will make some players whine, as a very good aim and timing are necessary. You have to defeat four opponents by shooting at their weak points — problem is, it isn’t clear which ones they are! The last one doesn’t really qualify as an arcade sequence and I found it to be quite clever. You can’t lose, or at least you have plenty of time to work it out and I never reached the limit, and it’s really fun. It involves defending the farm and switching between many of the (good) characters you met during your adventuring and shooting at the opponent they’re fighting each one them with a different kind of weapon. But good observation is required as they’re hiding behind somewhere, and you don’t have to necessarily shoot them but a special place in order to win this sequence, which is a perfect climax of an overall fine puzzle design. First of all, I should tell you that I’m a very tolerant gamer. Bugs, weird puzzle solutions, inhuman difficulty level and such doesn’t really bother me. If a game is good and keeps my interest up, I don’t care about those problems. As a matter of fact, don’t tell anyone, but I’m going to make a little confession — I don’t like to mention bugs on my reviews. I do this on purpose because it could harm sales of an otherwise fine product and 100% bug-free games are rarely seen these days. Obviously, I do this as long as those problems stay within some safe parameters — I have to watch for the sanity of our readers! Not long into the game I found myself getting stuck in a place and then having to restore, experienced nasty clipping problems, missing textures, looping sections of music like a scratched LP, missing animations and, on top of it all, an unwinable situation — to overcome this I had to restart the game after installing the latest patch. I could go on mentioning all the problems I had when I first installed The Westerner. Unpatched, the game is a mess, plain and simple. Even patched it is not bug-free, which makes me wonder what’s going to happen with the North-American release. However, Revistronic made a very clever move by adding some truly funny deleted scenes (“bloopers” actually) with the patch. Not only it fixes a great deal of errors, but those scenes, obviously intended to placate adventurers’ fury, make the download a must. Aside from being bug-infested, I noticed a few more things. First, there’s a rather “strategic” element in the game, which I welcome, but wasn’t well planned. As you know by now, Fenimore rides a horse to move around but you can’t pretend it to do it without having some food. Just like a vehicle needs combustible fuel, you have to feed it. Well, the combustible here is in the form of carrots, which you can find scattered around or available for buying at the convenience store. To get them in big amounts without expending any money though, you have to grow them at either one of the two farms you’ll visit during your adventures. To do this, you water them with the help of a bucket. The process is too slow and I found it taking me too much time to get just five carrots. You waste one carrot to move from location to location but, for instance, to get from one farm to the town, you have to waste three carrots because there’s another intermediate location. Since you must travel quite a bit and, depending on the order you solve puzzles, go back and forth, this can get annoying. I know what you’re wondering about but no, you can’t get stuck because at least one carrot will randomly appear inside a drawer every time you visit a location that is not a farm. In case you run out of carrots during travel, you automatically return to the Bannister farm. Which brings me to another point: drawers and closets. They hold either money or carrots and special items in some cases, but mostly money. Problem is, you find too many of them during the game and, since money is randomly generated, there will be many empty ones. These are minor quirks though but I realize the strategic element will bother some players. Clearly, Revistronic’s proprietary engine still needs a bit more work. There were path finding problems in some locations crowded with stuff and loading times can be a bit long. Also, the simple inventory system, which consists in scrolling through the items you possess, doesn’t fit for the huge amount of stuff you carry around. I found myself scrolling for several seconds in order to find one the items I took early in the game. Anyway, I’ve seen this same problem in some adventures lately so I don’t think it’s that serious. Those are minor, almost non-existent issues if we take into account the abysmal condition this game was released. I have some news for you: point n’ click is alive and kicking — and it’s better than ever! This is the thing that most surprised me from The Westerner: the ability to move around a lavishly rendered 3D world with just one hand. Give me this anytime over direct control. Sadly, this and perhaps the great characters and style are the only things I can rave about this game. The lack of a more involved plot, or perhaps more locations to visit, and gameplay issues prevent me of awarding it that magic A, not to mention the embarrassing bug problem. I also have the feeling that The Westerner might be too “passé” for the nowadays adventures general audience. Whereas adventures are now aiming towards more adult-oriented stories and less challenging puzzles, The Westerner is all the opposite, a throwback to the old days with a simplistic story filled with puzzles. You know how the game’s going to end right from the first minute — it’s how you get there the whole point of it. I believe that, if done well, a game like this could bring old-school adventuring back to the front but, as it is, it’ll probably pass unnoticed except for the most dedicated fans. The novel interface and engine could be the only thing that grabs the attention of the more “mainstream” adventures audience. Despite all the problems I found, it was only after watching the final sequence and the bloopers that I realized how much I had enjoyed this game. In the end, I didn’t care about the bugs, as much as annoying as they had been. Some moments were truly funny and I found myself laughing out loud in them. But, like I said before, that’s me and I’m aware some people might even feel cheated with a product like this. This is quite serious because, at some points, The Westerner looks like an early beta. To be fair, and because I really appreciate Revistronic’s effort, I will use two separate grades. So, as a final word, if you fancy an old-fashioned adventure with a truly modernized look, and don’t mind a few hundred bugs, you simply can’t go wrong with this game! Nice article! I’ve been meaning to play this game for a while now, but I feel like I need to catch up with many Spanish adventures before doing so. Hopefully, I still have a copy of this title laying around there somewhere.